No one ever said moving was easy. Friends turn away, and neighbors cringe when you break the news about your move to them. If you’re like most people, you’ll agree that the only thing worse than moving is moving cross-country or interstate. 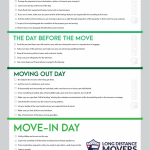 Thankfully, some tools and moving checklist that can help you make the most out of moving. 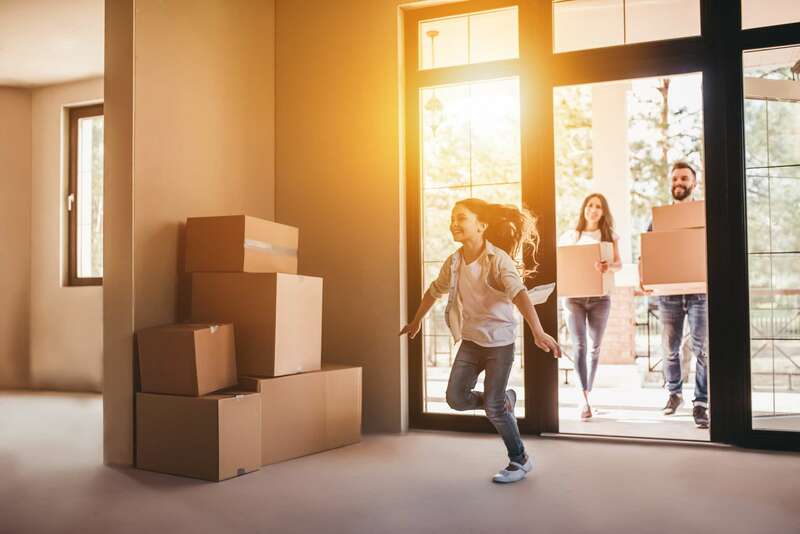 Yes, moving can be rewarding! Getting that new job, a change of scenery, meeting new friends, and making a stress-free transition from one location to another can be very beneficial to our sense of well-being and the progressive spirit. Of course, for everything there is a method that works best, said Descartes, the founder of modern logic. 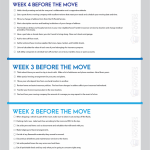 The following Moving Guide contains the most effective, tried and true, step by step guidelines to a successful move. Let the countdown begin! Hold a family meeting and ask for everyone’s collaboration and a supportive attitude. Get a quote from a moving company with excellent reviews that meet your needs and schedule your moving date and time. Fill out a change of address form from the US Postal Service. Alert subscription services and banking institutions of your change of address. Find medical, dental, and hospital services in your new neighborhood. Transfer insurance services by location and change medical providers, if necessary. Have a yard sale or donate items you don’t want to bring along. Clean out closets and garage. Ask for time off from work. Gather and purchase moving supplies like boxes, tape, markers, and bubble sheets. List and calculate the value of each one of your belongings for insurance purpose. Call utility companies to schedule turn off and turn on services, transfer, close, or open accounts. Phew! How did that feel? One down, three more to go. Breaking down the whole into its parts makes it so much easier. The following week, moving day starts to settle into your subconscious mind. Yes, you are moving! Think about those you want to stay in touch with. Make a list of addresses and phone numbers. Hand them yours. Make special moving arrangement for your pets and plants. Move your safe deposit box from one bank location to another. Review home and auto insurance policies. Find out how changes in address affect your insurance beforehand. Transfer your home insurance plan to the new location. Find out from your moving company the amount of coverage you may expect in the event of a loss. Two more weeks to go. They’ll go by in a breeze if you follow the next steps ahead. When shipping a vehicle is part of the move, make sure to clean it out and top off the fluids. Packing starts now. Label each box according to the room and fill it to the top. Set aside personal items such as documents and valuables that will travel with you. Make lodging and travel arrangements. Get rid of any flammable materials; they cannot be moved. Discontinue all delivery and maintenance services to the home. Set aside packed boxes for easy access and seal them. Eat all perishable foods and buy only what you’re going to consume right away. Clean out freezers and refrigerators of old and frozen foods. You’re almost there, take a deep breath, check the list, take care of any unfinished business. The day is coming! Arrange for payments at your destination, online, or however you arrange it. Leave room for tips at the end of the day. Drain fluids from equipment being moved such as lawnmowers. If you are a renter, make sure you paint and fix all the things that you are responsible for according to the lease. Ask the realtor at the location you are moving to give you a walk-through inspection of the property so there won’t be any surprises. Inspect, list and photograph the condition of the property you are leaving. Plan for keys to be dropped off, left behind, and received. Okay, you’ve tied all the loose ends, and you’re ready for the day of. Pack the personal items you will need to carry with you during the move in a separate box or luggage. Take a last tour of the premises and make sure you are not leaving anything behind. Keep all insurance policies, leases, and contracts, handy. Clean out your refrigerator for the last time. Get some sleep; you’ll need all your energy for the big day. Be ready for the movers when they get there. If disassembly and reassembly are included, make sure there are no loose parts left behind. take a final walkthrough, open and close cabinets, turn lights and ac off. household goods in the insurance coverage. location know you expected time of arrival. Verify utilities and access on the way. Supervise assembly of all furniture and placement of large appliances. If you made labor payments online, be ready to give labor a well-deserved tip. Shop for one or two days worth of food at a time until you’re settled in.